This introduction describes the motivation for this book, introduces a few key energy-environmental modeling concepts, and provides an overview of the remaining chapters. There were two major motivations for this book. 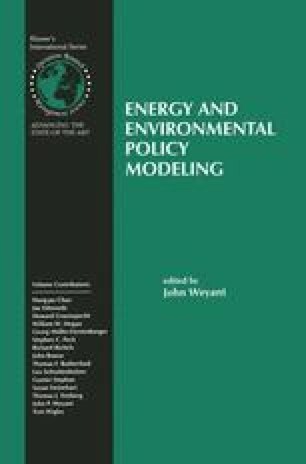 First, the application of management science techniques to energy and environment policy issues has expanded dramatically over the last twenty-five years or so, and results from these applications have become increasingly relied upon by those making decisions. Thus, an overview of some the most interesting work in this field on some of the biggest contemporary policy issues seemed like a worthy objective. Second, most of the authors of this volume participated in a 70th birthday celebration for Alan Manne of Stanford University in 1995 and thought dedicating this volume to him would be a fitting tribute to his many contributions to this field over the last several decades. Some of us have had the good fortune to have worked directly with Alan, others to have been his students, and others simply to read his papers, but we have all learned from him and been inspired by him and his work.